In the UK, the adoption of an interprofessional approach to health sciences education has increased greatly over the past decade. The origin of IPE is believed to be the World Health Organization(WHO) report; Learning Together to Work Together for Health, which encouraged the development of IPE activities across the world to promote effective teamwork. According to the UK Centre for the Advancement of Interprofessional Education (CAIPE), interprofessional education (IPE) occurs when members (or students) of two or more professions learn with, from and about one another to improve collaboration and the quality of care. This should not be confused with multidisciplinary education where two or more professions learn side by side. A key aspect of IPE is that it demands an interactive element in the learning experience for the participants. In the UK, IPE development has been partly driven by the UK government’s endorsement of IPE as a means for promoting collaboration between health and social care professionals. However, it has also been supported by educationalists, enthusiastic to encourage healthcare professionals to work more coherently with the ultimate intention of improving the quality of care delivered to patients. To date, IPE has not been adopted widely in third-level institutions in Ireland, although it continues to be driven by a number of key enthusiasts. It is anticipated that in the future there will be increased interest in the development of IPE particularly in view of the recent development of multidisciplinary primary care facilities. Primary care includes the range of services that are currently provided by general practitioners (GPs), public health nurses, general nurses, social workers, practice nurses, midwives, community mental health nurses, dieticians, dentists, community welfare officers, physiotherapists, occupational therapists, home helps, healthcare assistants, speech and language therapists, chiropodists, community pharmacists, psychologists and others. These facilities are seen as the future for healthcare delivery in Ireland. Primary care services are currently, and will in future be, delivered by multidisciplinary primary care teams who work closely together to meet an individual’s needs by providing a single point of contact to the health system. An individual’s care is overseen by a key case worker, one of the health professionals within the primary care team. Hence the requirement for each healthcare professional within the team to be familiar with the role of the other professions. The multidisciplinary nature of these facilities will necessitate healthcare professionals working together in a more integrated way than previously. In order to improve interdisciplinary communication it is important to introduce cross-discipline interaction during the undergraduate education years. IPE aims to facilitate effective teamworking, inform communication and understanding between professions and promote continuity of care. The challenge faced in the Irish healthcare system is about providing integrated and seamless care that is perceived as effective by the patient and is an acceptable part of the working practice of all professionals involved in their care. Changing the way we educate health professionals during pre-registration education may be key to achieving system change and to ensuring that health providers have the necessary knowledge and training to work effectively in interprofessional teams within the evolving healthcare system. Although IPE is now a mainstream in many health professional programmes, the evidence to underpin its value during pre-registration education is still limited. From an educational perspective, IPE is supported by constructivist learning theory where students from different disciplines work together simulating multidisciplinary teams (MDT) to develop a new understanding of their own and others’ professional roles. There appears to be reasonable evidence to support the value of IPE for changes in knowledge, skills, attitudes and beliefs. [12,13] However, whether this translates into changes in practice in the work environment, that is improved patient care, has yet to be established. [4,14] Evaluating the impact of IPE on working practices following completion of a preregistration health sciences programme, in terms of improving patient care, is complex and indeed it is the complexity of measuring such outcomes that probably limits the availability of evidence. However, further research is required in this area to ensure that current IPE practices in pre-registration programmes are indeed enhancing patient care. In terms of IPE undertaken post registration, a systematic review conducted by Reeves et al1 identified six trials (four randomised controlled trials[15–18] and two controlled before and after trials19,20) which examined the effectiveness of IPE when compared with a control group that received no education. Whereas four[16,18–20] of the six studies reported positive outcomes, a number of the authors identified poor correlation between improving staff attitudes (and understanding) with a failure to change work practices. [16,17] In the context of quality improvement initiatives, IPE is frequently used as a mechanism to enhance the development of practice and improve services. A key requirement for the successful introduction of an IPE module is the provision of opportunities where students from the different disciplines can interact and learn from and about their respective professions. The characteristics of quality IPE have been identified as the following: learning is common across professions, participants compare and contrast their roles; learning is interactive; learning should involve reflection and activities include experiential learning; planning involves an interprofessional team; learning outcomes include collaboration between professionals; and activities should challenge stereotypes. The objective of this study was to evaluate the students’ perceptions of a new IPE module. The design of the module was undertaken by an interdisciplinary group of health professionals (doctors, physiotherapists, radiographers and nurses) together with students from each discipline, librarians and an educational developer. This group designed five problems which addressed all the learning outcomes defined for the module. The areas addressed included: personal professional identity; professional identity of each member of the MDT; specific cases where the team members would have to work together (orthopaedics, respiratory, obesity); and communication of the role of team members to individuals outside the MDT. These areas were chosen as authenticity and customisation of IPE are important mechanisms for positive outcomes of IPE. This module was valued at five European Credit Transfer and Accumulation System (ECTS) credits. The workload over a 12-week semester was as follows: 16 hours small group work, four hours of seminars, four hours of lectures, 40 hours of specified learning activities and 50 hours of autonomous student learning. The assessment procedures required students to complete three pieces of written work that were based upon the learning outcomes identified by their own small individual group. The first piece of assessment was formative and the following two summative. The final assessment required students to work together to develop a presentation that was delivered on week 12 of the semester. Students from across the health science disciplines (medicine, nursing, physiotherapy and diagnostic imaging) elected to participate in this IPE module during two consecutive semesters. Following registration to the module students were divided into groups with between eight and ten students in each. The students from each discipline were dispersed as widely as possible between the groups in order to ensure a good interdisciplinary mix. Each PBL group had a staff facilitator from one of the health science disciplines. All PBL facilitatorswere required to attend educational training in advance of the module in relation to being a PBL facilitator. Evaluation of this module was undertaken bymeans of a questionnaire specifically designed for this study. The questionnaire was composed of two sections, A and B. Section A contained the quantitative element of the questionnaire and consisted of questions asking students to rate the module according to a series of nine questions on a scale of 1 to 5 (1 = strongly disagree, 2 = disagree, 3 = neither agree nor disagree, 4 = agree, 5 = strongly agree). For analysis purposes, these categories were collapsed into 1 = disagree, 2 = unsure and 3 = agree. The areas addressed in the questions were related to achievement of the module learning objectives, resource provision, library information skills, workload and overall satisfaction with the module. Section B was the qualitative component of the questionnaire designed in accordance with previous work undertaken by the authors. Students were presented with three opened-ended questions exploring (1)what the good aspects of the modulewere, (2) what improvements they would suggest and (3) any other comments they might have in relation to the module. All student responses were transcribed and analysed using the Framework Analysis (FA) method. FA aims to meet specific information needs and provide outcomes or recommendations, often within a short timescale. This form of analysis provides systematic and visible stages to the analysis process and although the general approach is inductive, it allows for the inclusion of a priori as well as emergent concepts when coding. Inter- and intracoder reliability were checked on a random selection of transcripts. Intracoder reliability showed 93% agreement. Intercoder reliability was checked by the primary researcher and an experienced qualitative researcher (GO’D) and showed 86% agreement, suggesting excellent agreement. Ninety-two students participated in the IPE module. The demographics of the students that participated are presented in Table 1. The majority of students that took this module were female (n = 70) and the median age of participants was 18 years (range 17–52 years). Of the 92 students that participated, 70 (78%) completed the post-module questionnaire. The results of the quantitative part of the questionnaire are presented in Table 2. 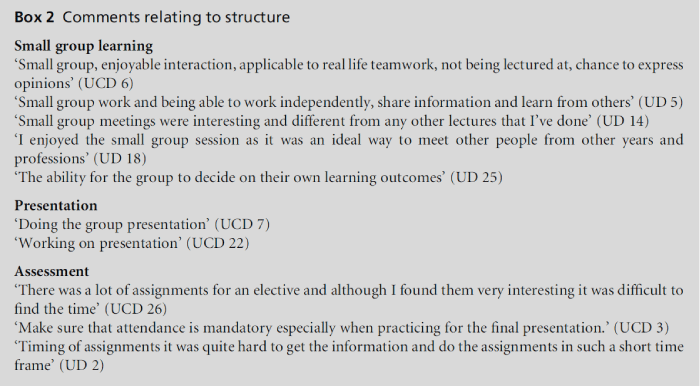 Students were asked to rate (1 = strongly disagree to 5 = strongly agree) 10 statements which covered the following areas: clarity of the module learning objectives, achievement of the learning objectives, level of intellectual stimulation, resources available within the module, library information skills within the module, module work load and overall satisfaction with the module. Seventy percent (n = 49) of students positively endorsed the module in terms of the statements posed. The majority of students agreed that the module objectives were clear and that the module enabled them to achieve their objectives. Eighty-seven percent (n = 61) of students found the module intellectually stimulating. Between 70% (n = 40) and 80% (n = 56) of students found the information resources available within the module to be valuable. Seventy-six percent (n = 53) of students found the amount of work required for the module to be appropriate and students overall satisfaction with the module was 91.4% (n = 64). Three predominant emergent themes were identified from the qualitative analysis of the open-ended questions: collaboration (learning with others from different professions), structure (small group learning, assessment, presentation) and content (problem diversity). Verbatim student quotes to illustrate the three themes are presented in Boxes 1, 2 and 3, all citations are followed by a code, corresponding to the student who returned the comment. Students specifically identified learning/working with students from other professions as being the best overall aspect of the module. Many students commented that during the module they learned about their own professional role and that of others in the multidisciplinary team (Box 1). Students commented positively on the structure of the module including the small group nature of the learning, the discussion within the groups and the development of teamwork. In terms of the small groups, they were happy with the control they had in relation to their learning during themodule (Box 2). Students expressed both negative and positive comments in relation to the assessments associated with the module. They commented that the final assignment, a presentation, which required the group to work together as a team, was the best aspect of the module (Box 2). In relation to the remainder of the assessment process, a number of issues identified by the students as being problematic included: assessment load, failure of individuals to attend group meeting particularly in relation to the final group assignment and timing of assessment submissions (Box 2). Students clearly valued the learning achieved during the module. Students did comment that they would like greater diversity in the problems presented during the module and particularly in relation to problems associated with the clinical setting (Box 3). Students who participated in this module reported it to be a positive experience, as evidenced by the level of student satisfaction following the module. Indeed, the majority of students positively endorsed the module in terms of the learning objectives, the interest level of the module, the module resources and the work required during the module. The qualitative aspect of the questionnaire, where students identified the best aspects of the module and the areas in which they believed improvements could be made, revealed a number of important themes: collaboration between professions, module structure and module content. Students identified collaboration with their fellow healthcare professionals as being important. They appeared to have an awareness of the importance of interacting and building good communication links with their colleagues. From the point of view of developing IPE, it is important that students value the experience of learning from and about the different professions that compose the multidisciplinary healthcare team. Some students readily identified the benefits of IPE and were able to make clear links to practice. The module encouraged students to work as a team, to rely upon one another and to explore the knowledge base of each health profession. Small group learning not only facilitates the acquisition of knowledge, but also enables the development of communication skills, teamwork, problemsolving, independent responsibility for learning, sharing information and respect for others. Students appeared to understand the importance of developing skills such as teamworking and collaboration which are essential for breaking down barriers and developing professional trust. This is in keeping with previous work undertaken to examine students’ experiences of IPE which found the development of interprofessional awareness to be a major theme.30 Similarly Taylor et al, following a study evaluating the effectiveness of an IPE module in terms of changing attitudes in health sciences students, reported that IPE cultivates respect among healthcare professionals and that students feel better able to function within a team. The teaching and learning strategy employed for this module was PBL. This provided the opportunity for students to solve problems within a small multidisciplinary group of health professionals. PBL is based on principles of adult learning theory, including motivating the students, encouraging them to set their own learning goals, and giving them a role in decisions that affect their own learning. Students valued the responsibility they were given in terms of controlling their own learning. Students liked the small group structure. In PBL, the group dynamics and the development of relationships that occur within a group are vital for the learning process. Clarke’s view of the IPE experience is that conflict is likely to arise but out of this greater understanding and insight can occur. Themodule developersweremindful to create authentic problems that would involve the interdisciplinary team. The assessment process was used to drive learning, whereby students submitted individual pieces of written work based upon the learning outcomes identified during their small group sessions and the final assessment.Apresentation developed and delivered by the group, required them to work cohesively as a group. Students identified that they would like more varied content within the module. A number of the students commented that they perceived the content to be too focused on communication and teamwork and indeed were keen to pursue more clinically based scenarios which would permit them to work in a more integrated way in terms of pursuing a team approach. In hindsight, this may be valid criticism and may have occurred due to an over eagerness on the part of the development team to facilitate team learning without sufficiently considering module content. In response to the results of this study, a number of modifications have been made to the module. First, more clinically focused problems have been introduced. In terms of assessment, the submission of the written assessments has been better spaced over the course of the semester and students have been given more time to prepare for the final presentation and finally, a small percentage of the grade awarded for the module is now awarded for attendance (5%). Limitations to this study are acknowledged. The students that participated in this module elected to do so and therefore may have been a biased sample. Questionnaire response in this study was voluntary and 24% (n = 22) of students did not respond. The non-responder students may have given different responses to those seen here. Additionally, while developing this module there were challenges associated with timetabling and resources. IPE needs the support of higher management within educational institutions in order to ensure adequate investment. The underlying intention of IPE is to breakdown stereotypes, build collaboration and teamworking and ultimately to improve patient care. In keeping with the findings of Forte and Fowler, students perceived that this module improved their knowledge and communication. Hallin et al examined the effect on patient perceptions of care delivered by an interprofessional student healthcare team as opposed to usual care. Patients receiving interprofessional care felt significantly more included in the decision-making process, felt their social situation was better considered and felt better informed than patients receiving usual care. It appears intuitive that building communication links at an early stage in professional development will lead to improved teamworking and ultimately better patient care. However, further research is required in this area. In the Irish context, incorporating IPE into health science educational curricula would certainly provide a good foundation for the health professionals of the future who will be employed to deliver the primary care strategy. It is essential that introduction of IPE to the curriculum be guided by sound educational theory. Incorporating IPE using a spiral curriculum design whereby IPE is revisited at different points, with increasing complexity throughout the professional programme allows the learner to review their previous learning while constructing new knowledge of more advanced concepts. Developing a pillar of IPE through the health science programmes would allow the development of a more coherent IPE curriculum. The most effective curriculum provides multiple opportunities to practice what is learned. To complement the learning achieved in the module presented here, it is intended to develop an IPE module for students in the clinical environment based around ‘real cases’. This study evaluating students’ perceptions of an IPE module has highlighted issues such as collaboration opportunities, module structure and content as being important from the students’ perspective when developing IPE. Since only students experience the curriculum in its entirety, their views are invaluable when designing educational interventions. Furthermore, student input to curriculum evaluation is critical because students constitute probably the most important group in educational enterprises. Norman I. Inter-professional education for pre-regis-tration students in the health professions: recent devel-opments in the UK and emerging lessons. International Journal of Nursing Studies 2005;42:119–23. World Health Organization. Learning together to work together for health. Report of a WHO Study Group on multiprofessional education of health personnel: the team approach. World Health Organization Technical Report Series. Geneva: WHO, 769, 1988. Barr H. Interprofessional Education. 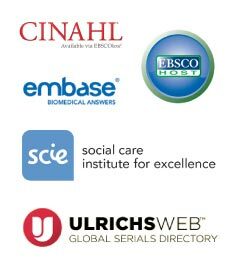 London: LTSN for Health Sciences and Practice, 2002.
Cooper H, Carlisle C, Gibbs T and Watkins C. Developing an evidence base for interdisciplinary learn-ing: a systematic review. Journal of Advanced Nursing 2001;35:228–37. Department of Health. Department of Health, The New NHS. London: TSO, 1997. Oandasan I and Reeves S. Key elements of interprofes-sional education. Part 2: Factors, processes and out-comes. 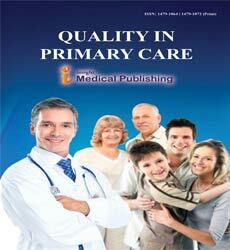 Journal of Interprofessional Professional Care 2005;Suppl. 1:39–48. Department of Health. Background – the need for change part 1. (accessed15 November 2011). Hammick M. Interprofessional education: concept, the-ory and application. Journal of Interprofessional Care 1998;12:323–32. Health Canada. Interprofessional Education for Collab-orative Patient-centred Practice. Ottawa: Health Canada, 2004. Curran VR, Sharpe D, Flynn K and Button P. A longi-tudinal study of the effect of an interprofessional edu-cation curriculum on student satisfaction and attitudes towards interprofessional teamwork and education. Journal of Interprofessional Care 2010;24:41–52. Cusack T, O’Donoghue G, Butler ML et al. A pilot study to evaluate the introduction of an inter-professional problem-based learning module. Interdisciplinary Journal of Problem Based Learning (in press). Reeves S, Zwarenstein M, Goldman J et al. The effec-tiveness of interprofessional education: key findings from a new systematic review. Journal of Interprofes-sional Care 2010;24(3):230–41. Campbell JC, Coben JH, McLoughlin E et al. An evaluation of a system-change training model to improve emergency department response to battered women. Academic Emergency Medicine 2001;8(2):131–8. Thompson C, Kinmonth AL, Stevens L, Peveler R, Stevens A and Ostler K. Effects of a clinical-practice guideline and practice-based education on detection and outcome of depression in primary care: Hampshire Depression Project randomised controlled trial. The Lancet 2000;355(15):185–91. Thompson R, Rivara F, Thompson D, Barlow W, SuggN and Maiuro R. Identification and management of domestic violence: a randomized trial. American Journal of Preventative Medicine 2000;19(4):253–63. Morney J, Simon R, Jay G et al. Error reduction and performance improvement in the emergency department through formal teamwork training: evaluation results of the Med Teams project. Health Services Research 2002;37(6):1553–81. Young A, Chinman M, Forquer S, Knight E, VogelHand Miller A. Use of consumer-led intervention to improve provider competencies. Psychiatric Services 2005;56(8): 967–75. Hammick M, Freeth D, Koppel I, Reeves S and Barr H. A best evidence systematic review of interprofessional education: EEME guide no. 9. Medical Teacher 2007; 29:736–51. Azer S. Twelve tips for creating trigger images for problem-based learning cases. Medical Teacher 2007; 29:93–7. European Commission Education and Training. European Credit Transfer and Accumulation System. Brussels: European Commission, 2011. ec.europa.eu/education/ lifelong-learning-policy/doc48_en.htm (accessed 29 November 2011). Barrows HS. A taxonomy of problem-based learning concepts. Medical Education 1986;20:481–6. Thompson C. Do interprofessional education and problem- based learning work together? The Clinical Teacher 2010;7:197–201. O’Donoghue G, Doody C and Cusack T. Using student centered evaluation for curriculum enhancement: an examination of undergraduate physiotherapy education in relation to physical activity and exercise prescription. Studies in Educational Evaluation 2011;37:170–6. 27 Ritchie J and Spenser L. Qualitative data analysis for applied policy research. In: Bryman B and Burgess J (eds) Analysing Qualitative Data. London: Routledge, 1994, pp. 173–93. MilesMBand Hubermann AM. Qualitative Data Analysis: an expanded sourcebook. London: Sage, 1994. Forte A and Fowler P. Participation in interprofessional education: an evaluation of student and staff experiences Journal of Interprofessional Care 2009;23(2):58– 66. Clarke P. What would a theory of interprofessional education look like? Some suggestions for developing a theoretical framework for teamwork training. Journal of Interprofessional Care 2006;20(6):577–89. Barrett T, CashmanDand Moore S. Designing problems and triggers in different media. In: Barrett T and Moore S (eds) New Approaches to Problem-based Learning Revitalising Your Practice in Higher Education. New York: Routledge, 2011, pp. 18–35. Hallin K, Henriksson P, DalenNand Kiessling A. Effects of interprofessional education on patient perceived quality of care. Medical Teacher 2011;33:e22–6. Knight PT. Complexity and curriculum: a process approach to curriculum-making. Teaching in Higher Education 2001;6(3):369–81. Diamond RM. Designing and Assessing Courses and Curricula. A practical guide (3e). San Francisco: Jossey- Bass, 2008.